Meilo So's illustrations give an entirely unexpected setting to a classic and profound story. The tale itself originates from Jesus; it tells of a person's quest to find the finest pearls in all the world, and his surprising discovery about what is really important. - Publisher This tale, which is adapted from Jesus' parable of the pearl of great price, tells of a person's quest to find the world and his surprising discovery about what is really important. 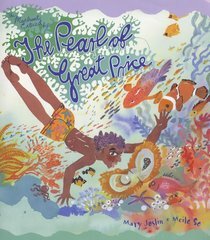 About "The Pearl of Great Price (Tales From The Bible Series)"
This tale, which is adapted from Jesus' parable of the pearl of great price, tells of a person's quest to find the world and his surprising discovery about what is really important. Mary Joslin, published exclusively by Lion, is known for her children's books on belief and spirituality. Her books, which include The Story of the Cross and On That Christmas Night, have sold more than 200,000 copies.